Create Milky Way and nightscape images with a tripod-mounted camera and wide angle lens. Put your camera on a motorized sky tracker for richer and more detailed images. 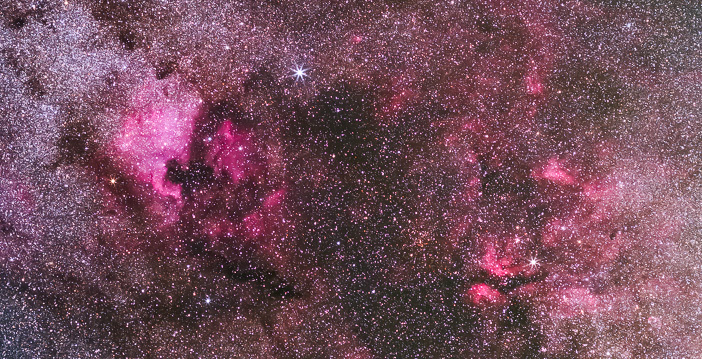 Attach your camera to a small telescope or telephoto lens mounted on a more advanced tracker (“equatorial mount”) to photograph colorful nebula, distant galaxies, and more. Noise is prevalent in long exposures of low-light subjects. Dark skies are becoming harder to find. Results straight from the camera often look terrible, and require some new processing skills to produce attractive images. You'll need to stay up late. But you'll be rewarded for your efforts. Seeing the Milky Way stretch across a truly dark sky will take your breath away. You'll discover that your camera can see beautiful things in a dark sky that your eyes can't. And it may introduce you to the wonders of the Universe far beyond our tiny blue planet. A 180° panorama of the Summer Milky Way. EOS 6D and 24mm f/1.4 lens. ISO 6400, 30 sec. White Mountains, CA (2018).